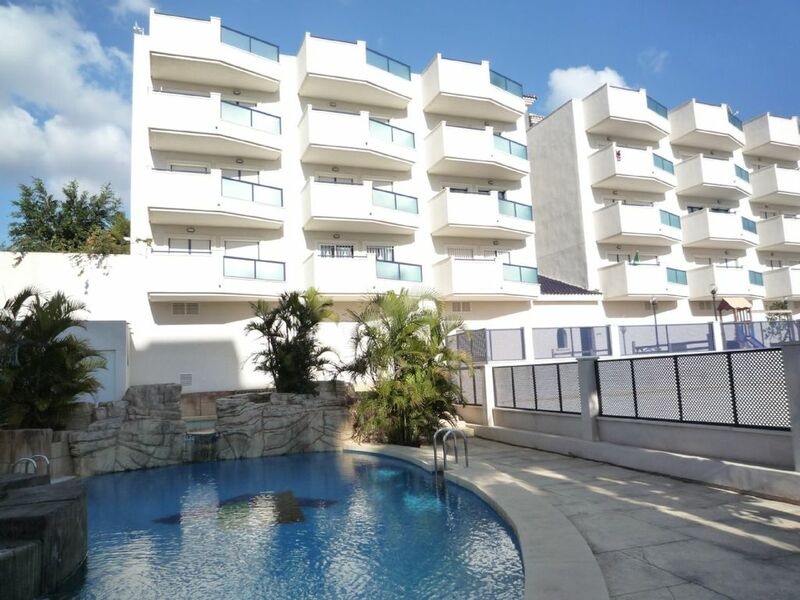 Our holiday apartment is located in an apartment complex that is only 150 m from the beaches of La Zenia. The complex is located on a peaceful side street without through-traffic. Our holiday apartment is located on the top floor. It is equipped with two bedrooms, a bathroom, a spacious living and dining area with a bordering kitchen, a balcony and a large roof deck. The large bedroom and the living room each have access to the balcony. You can get to the roof deck from the interior stairs. From there you will have a great view over La Zenia and the sea. The patio with chairs and a sun umbrella is a dream for those who love the sun. In the inner courtyard of the complex, you will find seats to relax, a small playground and the pool facilities. The highlight of the pool facilities is the upper jacuzzi. Restaurants, cafes and bars are right around the corner. Long term rental/winter:: Long-term rentals or guests that would like to stay by us during the winter are very welcome. Prices upon request. Contact on-site:: For questions and problems, you will have a contact on site. Transfer from the airport:: We would be happy to organize your pick-up from the airport or to be of any help with the booking of a rental car. The holiday apartment is located on the second floor and can be reached through an elevator. For the small guests, there is a small playground in the inner courtyard. The location is ideal, a short 3 min walk to the beach and also the shopping centre and restaurants all within walking distance . Apartment was clean with great outdoor space with private rooftop and balcony . Everything I needed inside . The pool area was also clean and lifeguard on duty friendly . Owner Michael very friendly and helpful with any queries . Highly recommend this apartment . Clean well equipped apartment. Easy walking distance to the beach and all La Zenias amenities. Nice welcome on arrival by Christina. Will definitely stay again. The pool area is lovely and the whole block is well kept. No sunbeds around the pool so worth investing in a cheap one at rhe start of the holiday. Michael was very prompt on arrival and good communication on booking. Would definitely stay again. Wie korrekt waren Die Angaben im Online-Inserat bezüglich Lage, Ausstattung waren korrekt. Das Oblekt war sauber und geplegt. Der Vermieter hatte alles gut vorbereitet. Man kann das Objekt problemlos weiterempfehlen. Ea gibt jede Menge Freizeitmöglichkeiten und Restaurants in der Nähe. Diese Ferienwohnung entspricht der Beschreibung im Internet,sie ist in sauberem und gepflegtem Zustand ,wir haben uns 6 Wochen dort sehr wohl gefühlt,der Ansprechpartner ist sehr zuverlässig und hilfsbereit.Der Strand ist schnell erreichbar,auch viele Einkaufsmöglichkeiten sind in der Nähe .Pubs und gute Eßlokale vor Ort. Bushaltestelle um die Ecke.Erwähnenswert ist noch der traumhaft große ,sonnige Balkon mit Liegemöglichkeiten und die riesige sonnige Terasse mit Meerblick. From the airport, it is 50 km. The airport San Javier (Murcia) is 25 km away. The center of La Zenia with countless cafes, bars and restaurants is only a few minutes walk from the holiday complex. There you will also find a supermarket that leaves no wishes unfulfilled. 3 tennis courts are also located nearby. A restaurant and a few cafes are located right around the corner. Golf: The region is very suitable for golfers. According to skill or preference, there are appropriate golf courses. I would be happy to help you with the selection and the booking of a golf course. If you would like, I could take over the entire organization so that you can concentrate solely on your favorite sport. Upon request, I can send you an overview of the golf courses via email. Golf clubs and trolley rental - arrangement for solo players. Nebenkosten wie Strom, Wasser und Bettwäsche sind im Mietpreis bereits enthalten und beziehen sich auf eine Belegung bis max. 4 Personen. Die 5. Person wird mit 5 Euro extra pro Tag berechnet. Der Preis für die Endreinigung beträgt 60 Euro. Bei Buchung ist eine Anzahlung in Höhe von 20 Prozent des Gesamtbetrages fällig.